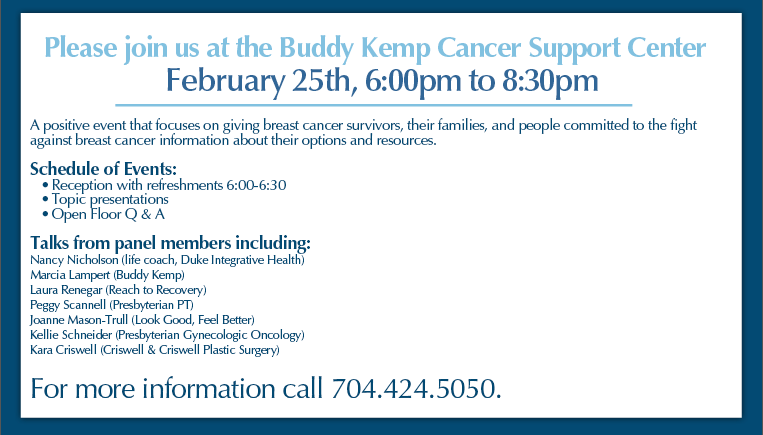 Please come join us at the Buddy Kemp Cancer Support Center on February 25th, 6:00pm to 8:30pm. The event will focus on giving breast cancer survivors, their families, and people committed to the fight against breast cancer information about their options and resources. There will be refreshments, topics presented by special guest speakers including Criswell & Criswell Plastic Surgery’s own Dr. Kara Criswell, as well as an open floor Q & A. We look forward to this event and hope you will join us. For more information about this event please call (704)-424-5050 or visit the Buddy Kemp Cancer Survivor webpage here. For more information about Criswell and Criswell Plastic Surgery or to set up a free consultation please visit www.criswellandcriswell.com or call (704)-424-5050.